Even before the 1959 cars debuted, Nance and Mills had been thinking about taking Edsel in a completely new direction. 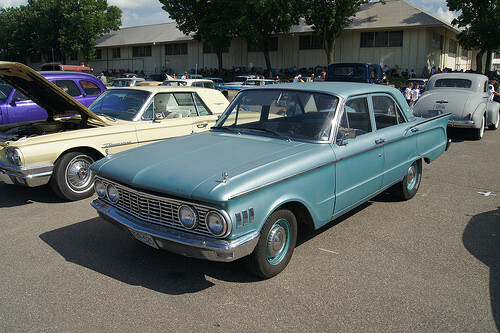 Ford was then busily developing a new compact model, which emerged as the 1960 Ford Falcon. With small-car sales booming since the start of the recession, Mercury-Edsel-Lincoln dealers were screaming for a compact of their own. Nance and Mills decided that the logical answer was to offer an M-E-L version of the compact as an Edsel, which would kill several birds with a single stone: salvaging the Edsel brand, giving it a unique product, and avoiding the risk of damaging the market position of either Mercury or Lincoln by adding an economy model. The board approved this plan in September 1958, shortly after Nance’s departure. The Edsel compact, originally known simply as “Edsel B” and later called Comet, would share the Falcon’s body and running gear, but would be somewhat bigger and a little more expensive, allowing a higher level of trim and features than its Ford cousin. The plan was for the Comet to supplement the larger Edsels for 1960 and then to replace them entirely by 1961, demoting the E-Car from mid-priced model to upscale economy car. Edsel didn’t make it that far. 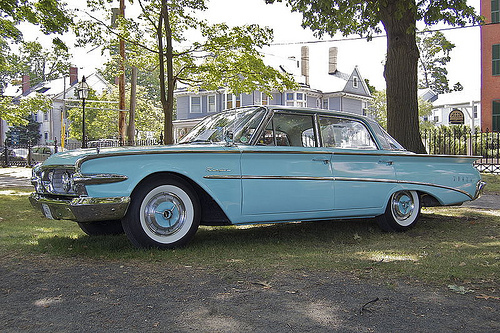 The 1960 models debuted on October 15, but M-E-L received only about 2,400 orders from almost 1,500 Edsel franchises. By then, many Edsel dealers had either given up, gone under, or hedged their bets by adding Ford and/or Lincoln-Mercury franchises. Having already been burned once, most of the remaining dealers were unwilling to take a chance on yet another new Edsel. McNamara, of course, was more than willing to pull the plug. On November 19, Ford announced the end of the Edsel brand and offered hefty dealer incentives to clear stocks of unsold cars. Sales for the abbreviated 1960 model year totaled only 2,846, bringing total Edsel production to 110,847 cars in three model years. If Edsel had still been a separate division at that point, the Comet might have died with it, but Ben Mills saw no reason to throw away a promising new product. The Comet went on sale through Lincoln-Mercury dealers in March 1960, about four months after the Falcon. Although contemporary reviewers tended to describe it as a Mercury, the early Comet was technically a separate make with no other marque identification. It didn’t matter; the Comet sold more than 116,000 units, exceeding the entire three-year total of its late parent and helping to carry Lincoln-Mercury dealers through a difficult period. The Comet’s success inspired the very successful intermediate Ford Fairlane and a whole genre of midsize cars. There is no doubt that Ford lost a lot of money on the Edsel fiasco. The most commonly cited figure is $250 million (equivalent to almost $1.9 billion in 2010 dollars), which was the cost Ford announced for launching the new model. Ford spent about $100 million on marketing and the overhead costs of running Edsel as a separate division; as a point of comparison, Ford said that re-consolidating Lincoln and Mercury in 1957 saved about $80 million a year in administration and overhead expense. The estimated $150 million spent on factory expansion was obviously not a total loss, since Ford continued to use that capacity after the Edsel was gone. Regardless of the actual dollar losses, the whole debacle had other costs. First, we suspect that a fair number of the sales Edsel did achieve came at the expense of Mercury. The first Park Lane sold poorly and most Mercury sales in 1958-1959 were low-end models that competed directly with Edsel in size and price. Second, not sharing bodies between Mercury and Lincoln proved to be very expensive. The 1958-1960 Lincolns also lost money and Lincoln came very close to cancellation, although it was saved by the new 1961 Continental. Third, and perhaps most seriously, Ford never actually plugged the gap between Mercury and Lincoln, so the E-Car’s original objective remained unfulfilled. Over the years, historians have laid the blame for the Edsel’s failure on many things: the styling, the name, the market research, the poor timing of its debut. There’s some truth to each of those conclusions, but we think that the E-Car’s greatest failing was that Ford lost sight of what it was supposed to be. The initial goal — filling a hole in the lineup — was straightforward enough, but it was completely overshadowed by nine years of political gamesmanship. When the E-Car finally appeared, it was redundant. Even if the market had been better, the best it could have done was to eat away even more at Mercury’s market share. The Edsel didn’t simply fail; it never had a chance. The Edsel remained a sore subject within Ford for many years after its demise. Lee Iacocca, who became general manager of Ford Division in 1960, convinced Henry Ford II to cancel the FWD subcompact Cardinal by warning him that it would be another E-Car. The Edsel’s failure was particularly bitter for Henry Ford; not only had it lost a huge amount of money, it had made a joke of his late father’s name. Edsel — both the car and the man — deserved better. Our sources for this article included “Advertising: The Buick Winner,” TIME 24 February 1958, www.time. com, accessed 3 March 2010; the Auto Editors of Consumer Guide, “1960 Edsel,” HowStuffWorks.com, 16 September 2007, auto.howstuffworks. com/ 1960-edsel.htm, accessed 2 March 2010, “1960-1963 Mercury Comet,” HowStuffWorks.com, 21 August 2007, www.howstuffworks. com/ 1960-1963-mercury-comet.htm, accessed 3 March 2010, and Encyclopedia of American Cars: Over 65 Years of Automotive History (Lincolnwood, IL: Publications International, 1996); “Autos: The Newest Car,” TIME 2 September 1957, www.time. com, accessed 3 March 2010; “Autos: The $250 Million Flop,” TIME 30 November 1959, www.time. com/ time/magazine/article/ 0,9171,826017,00.html, accessed 3 March 2010; Larry Blodget, “The Forgotten Edsel,” Car Classics February 1975, reprinted in Edsel 1957-1960 Road Test Limited Edition, ed. R.M. Clarke (Cobham, England: Brooklands Books Ltd., ca. 1997); Thomas R. Bonsall, Disaster in Dearborn: The Story of the Edsel (Stanford, CA: Stanford General Books, 2002); Douglas Brinkley, Wheels for the World: Henry Ford, His Company, and a Century of Progress (New York: Viking Press, 2003); Arch Brown, “Luxury in a Tidy Package: 1952 Lincoln,” from Special Interest Autos #73 (January-February 1983), reprinted in The Hemmings Book of Lincolns: driveReports from Special Interest Autos magazine, ed. Terry Ehrich (Bennington, VT: Hemmings Motor News, 2002); Dave Crippen, “The Reminiscences of Eugene [Gene] Bordinat, Jr.,” 27 June 1984, Automotive Design Oral History Project, Benson Ford Research Center, Accession 1673, www.autolife.umd.umich. edu/Design/ Bordinat_interview.htm [transcript], accessed 8 March 2010; Kathleen A. Ervin, “Edsel: An Auto Biography,” Failuremag.com, 6 March 2002, failuremag. com, accessed 2 March 2, 2010; Jonathan Glancey, “How bad was the Edsel?” Classic & Sports Car September 1988, reprinted in Edsel 1957-1960 Road Test Limited Edition; John Gunnell, ed., Standard Catalog of American Cars 1946-1975 Revised 4th Edition (Iola, WI: Krause Publications, 2002); David Halberstam, The Reckoning (New York: William Morrow and Company, 1986); Tim Howley, “1950 Lincoln: More than a Mercury,” Special Interest Autos #130 (July-August 1992), reprinted in The Hemmings Book of Lincolns; Tim Howley, “SIA Comparison Report: 1950 Mercury vs. 1950 Oldsmobile 88,” Special Interest Autos #124 (July-August 1991), reprinted in The Hemmings Book of Mercurys: driveReports from Special Interest Autos magazine, ed. Richard A. Lentinello (Bennington, VT: Hemmings Motor News, 2002); Lee Iacocca, Iacocca: An Autobiography (New York: Bantam Books, 1984); Robert Lacey, Ford: The Men and the Machine (Boston: Little, Brown and Company, 1986); Michael Lamm, “1950 Mercury,” Special Interest Autos #12 (August-September 1972) reprinted in The Hemmings Book of Mercurys, “Mark II Meets Eldorado Brougham,” Special Interest Autos #2 (November-December 1970), reprinted in The Hemmings Motor News Book of Cadillacs: driveReports from Hemmings Special Interest Autos magazine, ed. Terry Ehrich (Bennington, VT: Hemmings Motor News, 2000), and “Revenge of the Edsel,” Car Life May 1969, reprinted in Edsel 1957-1960 Road Test Limited Edition; Michael Lamm and David L. Lewis, “The First Mercury & How It Came to Be,” Special Interest Autos #23 (July-August 1974), reprinted in The Hemmings Book of Mercurys; David L. Lewis, “Ford’s Postwar Light Car,” Special Interest Autos #13 (October-November 1972): 22–27, 57; and “Lincoln Cosmopolitan: The Gleam in Edsel Ford’s Eye,” Car Classics April 1973, reprinted in Lincoln Gold Portfolio, 1949-1960, ed. R.M. Clarke (Cobham, England: Brooklands Books Ltd., ca. 1990); George Mattar, “1958 Pacer Panache,” Hemmings Classic Car #4 (January 2005): 48–53; Vance Packard, The Hidden Persuaders (New York: David McKay Company, 1957); Phil Skinner’s The Edsel Pages, 1999-2010, www.edsel. com/ index.html, including R. Lee Parks, “Dealer Recollections” (26 April 2003, www.edsel. com/ division/rlee.htm) and Tom Sneary, “Reflections of the Edsel Days” (8 February 2001, www.edsel. com, accessed 3 March 2010; Daniel Strohl, “Classy Commuter,” Hemmings Classic Car June 2006; “The Comet,” Road & Track Vol. 11, No. 8 (April 1960), reprinted in Mercury Comet & Cyclone 1960-1970 (A Brooklands Road Test Limited Edition), ed. R.M. Clarke (Cobham, England: Brooklands Books Ltd., ca. 1999); “The Secrets of Ford,” TIME 2 January 1956, www.time. com, accessed 3 March 2010; C. Gayle Warnock, The Rest of the Edsel Affair (Bloomington, IN: AuthorHouse, 2007); Mary Wilkins and Franck Hill, American Business Abroad: Ford on Six Continents (Detroit: Wayne State University Press, 1964); and Anthony Young, “The Rise and Fall of the Edsel,” The Freeman September 1989, www.theadvocates. org/ freeman/8909youn.html, accessed 2 March 2010. We also consulted the following period road tests: Malcolm Andrews, “…Who Needs an Edsel?” Motor Life, September 1957; Robert Matthews, “Should You Buy an Edsel?” Speed Age, September 1957; “The New Edsel,” Motor Life October 1957; Jim Whipple, “1958 Edsel Consumer Analysis,” Car Life October 1957; Warren Weith, “First Tech Report on the Edsel,” Speed Age October 1957; Joe H. Wherry, “How Good Is the Edsel?” Motor Trend October 1957; Al Outcalt, “Edsel: Fireball or Flop?” Car Life March 1958; Roger Huntington, “What Happened to the Edsel?” Autocar, 23 May 1958; “Edsel aims for lower price field…basic styling retains original look,” Motor Life December 1958; Jim Whipple, “1959 Edsel Consumer Analysis,” Car Life March 1959; Al Berger, “Speed Age Expert Test: Edsel: New Era for the Big ‘E,'” Speed Age June 1959; and “Edsel: a change in personality for Ford’s famous infant,” Motor Life December 1959, all of which are reprinted in Edsel 1957-1960 Road Test Limited Edition. The Ford Edsel project looks like an excuse for the execs to justify their paychecks. Seems they were chasing something that was within reach, but failed. Since Mercury had the big Turnpike Cruiser and Park Lane model for ’57 and ’58, I never understood why FoMoCo though they needed the Edsel. With Mercury’s new line-up, the were very competitive with Oldsmobile and Buick. Well, as the article explains, even though Mercury was doing quite well in the early to mid-fifties, their volume was quite a bit lower than the combined total of Buick-Olds-Pontiac, and there was a vast chasm in price between Mercury and Lincoln. The Park Lane was intended to address the latter problem (although it didn’t do a very good job of it; its early sales were awful), but it didn’t address the former. Part of the rationale of the Edsel was to try to expand FoMoCo’s total dealer base — GM had over twice as many dealers as Ford did, and there are only so many cars each dealer can move. Ford figured that by adding a new brand (originally intended to fit above Mercury), they could also add a bunch of new franchises, and they’d be in a better position to match B-O-P on overall sales volume. Obviously, it didn’t work out that way, but that was the plan. The ’60 and ’61 Comets were not part of Mercury’s line up. The Comet, like the Valiant was a brand of its own. !962 was the first year the Comet wore a Mercury nameplate. Thanks for catching that! I double-checked, and you’re quite right. I amended the text to fix that, both here and in the Fairlane/Comet article. Another interesting bit of Comet history is that the ’60 Comet used the Edsel’s stylised “E” in the C-O-M-E-T identification on the rear of the car. I spotted some pictures of clay models of the proposed "Edsel Comet" at . And someone imagined what if there was a 1961 Edsel Corsair as well as a 1962 model. Strangely in Canada, there was a line-up called Meteor who was between Ford and Mercury and it did better then the Edsel. Very interesting. I’m not terribly familiar with the Canadian market, but I do know that both then and now, there have been some upscale versions of what in the U.S. were fairly plebeian cars — the Pontiac Laurentian in the fifties (essentially a Chevrolet trimmed like a Pontiac), and more recently the Acura EL, an upscale version of the Honda Civic. I didn’t know about the Edsel-Comet relationship, but I’ve noticed that the early Comet and the ’60 Edsel had the same tail light lenses. I became friends with Emmett Judge, who was a splendid guy. He headed sales a Lincoln Mercury and took a lot of heat while trying to repair the Edsel mess. He was VP sales at Lincoln Mercury and actually showed up at my house while visiting his daughter at school in La Jolla. He sponsored the Ed Sullivan show and was the one who had to tell Ed that the show was ending. He had also been VP at Westinghouse. His background was engineering and my acquaintance came about when he was a director of a company I worked for. Strange to say, I had a slab-sided Continental when he visited me at home and worked on the window motors which had some problems. I also had had a ’62 Comet wagon. Wonderful car, wish I had it now. Emmett Judge apparently wrote a book on the Edsel. Does anyone know where to find one? We had a 1959 Edsel with the 361 FE block with a four barrel Holley. It was a powerful car, and ran perfectly. It was really just an early 1960s LTD.
A friend had one with the MEL 410 block, and it was quick for the time. I think the Edsel was a car that was just a little ahead of the times. People were not ready for it yet. But as for the cars themselves, they were fine.